Would you like to grow a year’s worth of sweet potatoes? It’s easier than you think! With the Sweet Potato Grow Guide, you will discover the rule-breaking tips I used to grow 67.8 pounds of sweet potatoes in my front yard garden. Then, you can turn that knowledge into homegrown sweet potatoes of your own! Start your own sweet potato plants for pennies each. Plant and tend your crop without chemicals. Landscape with sweet potatoes (even in the front yard!). Harvest and store a winter’s worth of sweets. And more, including recommendations for some of my favorite sweet potato varieties and the garden suppliers and seed companies where you can buy them. This is an ebook in pdf format. Perfect for reading on any electronic device, or for printing out to read in the offline world. When you buy your ebook, you get it immediately. No waiting for shipping. Sweet potatoes are gorgeous, making them a great addition to any front yard rule-breaking garden or edible landscape. And, of course, sweets are delicious. 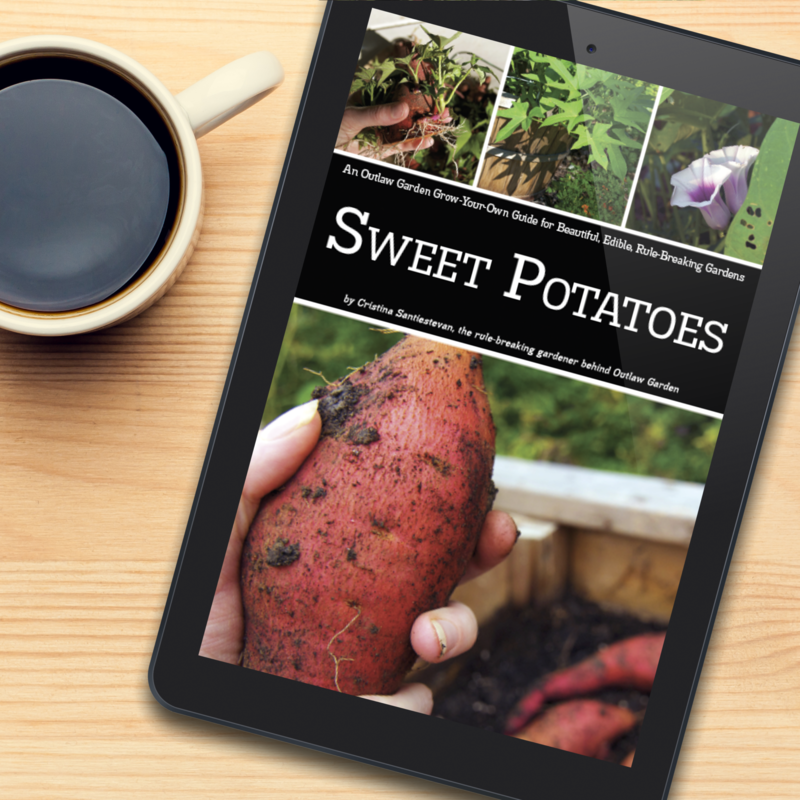 Now, with the help of this guide, you will learn the secrets to make sweet potatoes easy to grow, harvest, and store. I wrote this guide to help you grow more sweet potatoes — a lot more sweet potatoes — and I absolutely believe it will. But, if you disagree, I want to hear from you. Both so I can give you your money back (that’s the way a 100% guarantee works, after all), and also so you can tell me what you didn’t love about the book (so I can make it better for future readers, and maybe you too).